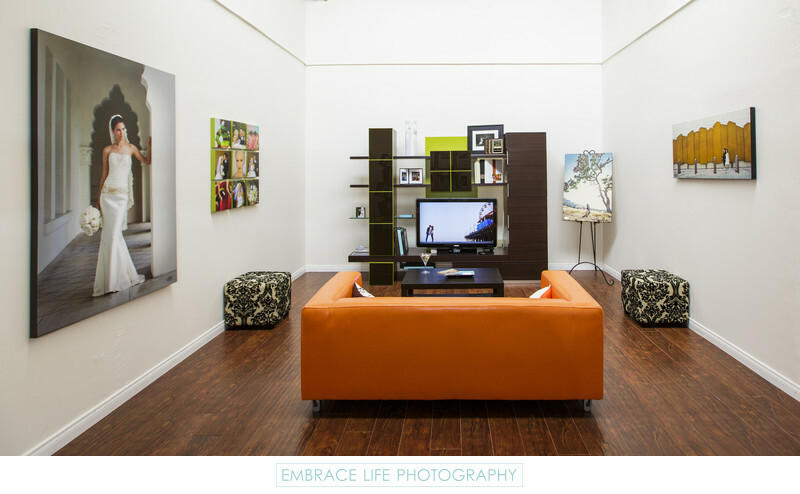 This photograph of Embrace Life Photography's first Santa Monica photography studio shows a number of different wall prints. The bridal portrait on the left is a 40x60 canvas. Just past that is a collection of nine 10x10 canvas prints of a Sonoma wedding. On the entertainment unit sits several smaller prints. On the easel is a 24x36 canvas print of an engagement portrait. On the right wall is a 20x40 canvas print of a Palm Springs elopement photograph.